Our ancestors have left behind marks of their lives, with and without intention. The ones with a purpose are rock paintings, petroglyphs and tombs. 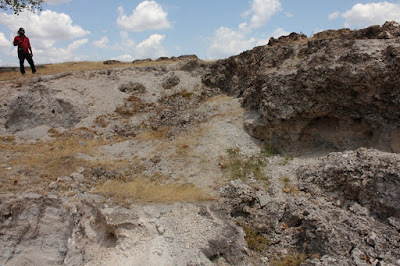 The ones which just remained are ash-mounds. Why and how were these ash-mounds created? Obviously when combustible material was burned completely, what remains at the end of the process is ash. Considering the Neolithic lifestyle, the material that were burnt could be wood, cow-dung cakes and agricultural waste. Reason for making the fire could be to bake earthenware like pots, jars, plates, toys, jewellery and stoves. It is also possible that fire was made to dispose house-hold stuff during an annual ritual. Or its even possible that human bodies were burnt in a mass cremation after a battle or an epidemic. Hundreds of ash mounds were located across the northern part of Karnataka. 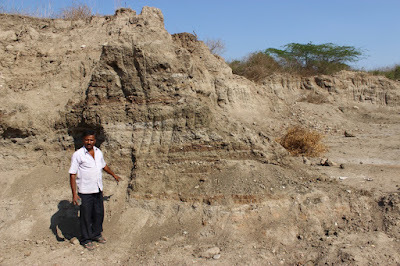 The well known sites are Kappagallu, Budihal, Kudathini and Hallur - these are the ones I've visited. 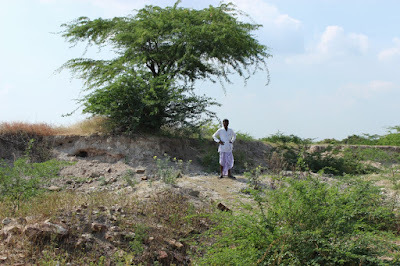 Here's the first prehistoric ash-mound I ever saw.. the one next to Hiregudda near Sanaganakallu. Many years ago there were three of them, two mounds were flattened out to facilitate cultivation and only one remains now. 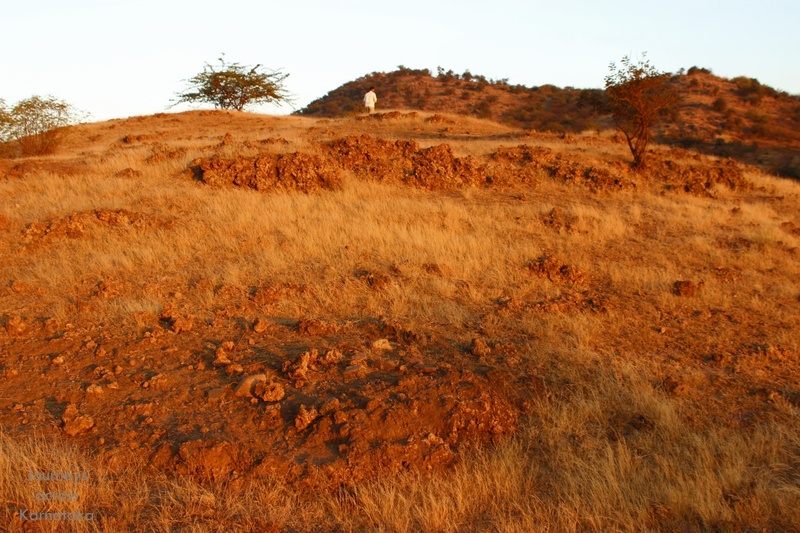 This mound id about 60 meters by 40 meters by 3 meters, its well preserved. Thanks to our friend Ramadasa for patiently sharing his thoughts. This ash is supposed to be the remains of excessively burnt cow-dung and wood. It is believed that prehistoric cattle keepers burnt heaps of cow-dung during an annual ritual or cleansing process. It is also possible that fires were kept burning to keep away wild animals. Ash hardens when it comes in contact with moisture and oxygen rich air for extended periods of time. Budhihal was the second site. There were several low mounds, all were badly damaged. Eranna, resident of Budihal walked me around and found lot of earthen pottery pieces. Local people had hauled away cart loads of this ash to their fields.. they consider this as good fertilizer. Though archaeologists have confirmed this as a Neolithic site, there's no action taken to protect the mounds. The ash-mound at Kudathini is probably the best preserved one. It measures about 191 meters by 50 meters by 7 meters high. The surface is hard yet soft enough for grass to thrive on it. Though the mound is located on a state highway, it has been left intact, probably this is a preserved site though there's no board declaring it as protected. Probably there was a board planted later it got stolen. 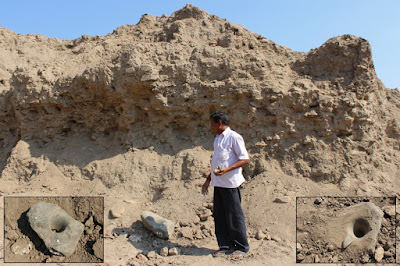 Ash-mound at Hallur, on the left bank of river Tungabhadra is the largest one ever seen. 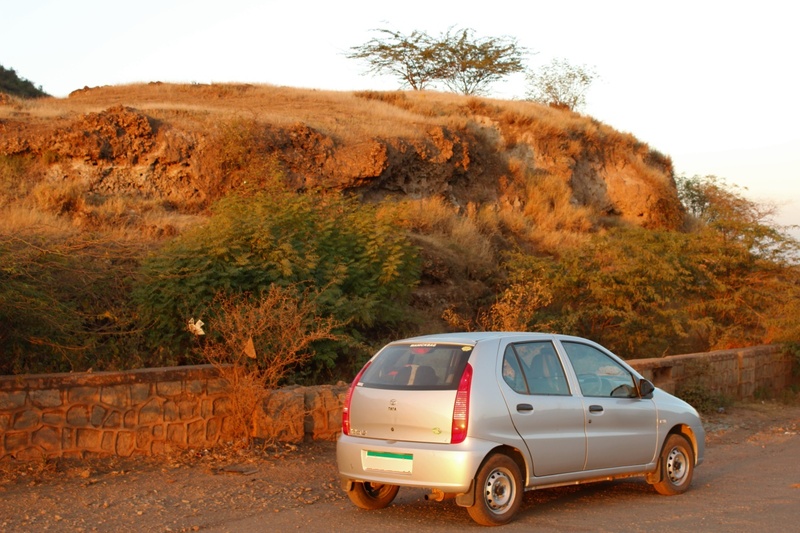 The mound is spread over 30 acres easily, and reaches heights of 10 meters at places. The mound was a site to a fort as well, even to this day ruins of walls can be seen. Suresh a resident of Hallur village showed me all over the site. Literally every step I could see pieces of pottery.. black, red, brown. 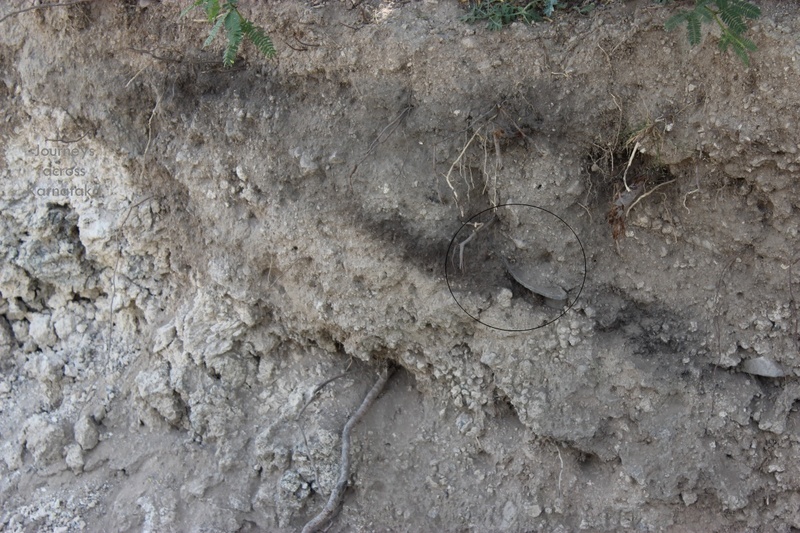 We found charcoal pieces, layers of different types of soil, grinding stones, bones, hair, and what not. Considering the size, it could be the oldest ash-mound as well. However, the sad part is the monument is it's completely neglected, rather ignored by governments. The worst part is this - residents of Hallur village are hauling away the ash by tractor-trailers to their fields.. it seems farmers consider this a very good fertilizer. People are totally ignorant about their prehistoric heritage. 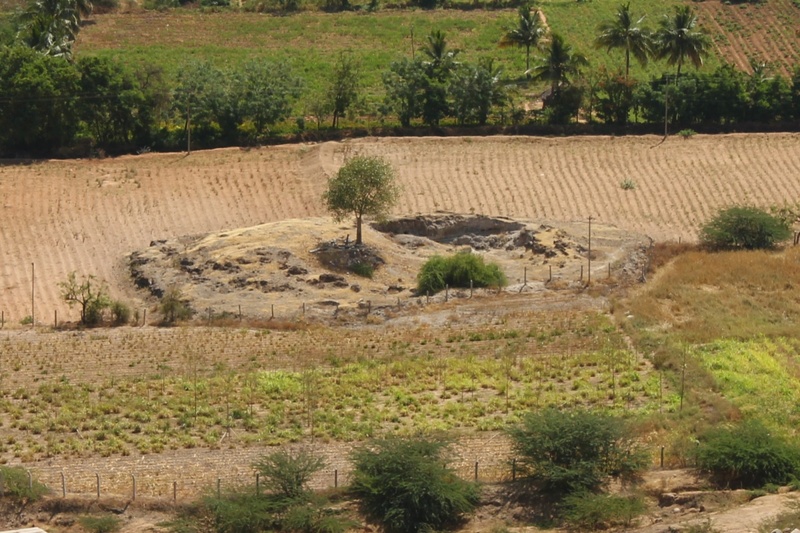 Here's a list of known ash-mounds in Karnataka state. This is some really good work done by you. I would suggest that please start writing to concerned authorities and maybe they will be moved enough to protect a few of these mounds before they all disappear. Yes, Nirdesh. I'll write to ASI soon. In fact long back I'd written to ASI about a vandal act on an ancient inscription in a temple at Sudi (near Ron), there was not a line in response to my email. Anyway, I'll try again.